At Shiokr, we take pride in offering only waterless car washes. Our model also gives you supreme convenience of use of booking a car wash via an app. Waterless car washes are not only beneficial to the environment but it also produces similar or better results than a water-based wash.
You’ve probably heard about a waterless car wash or a spray on car wash or a dry car wash, but there’s a lot you might not know about! 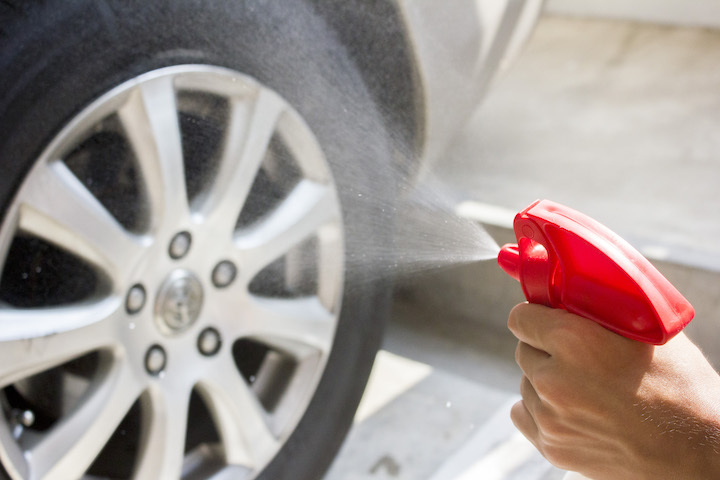 In this post, we will cover the basics of a waterless car wash, the results you can achieve and how you can wash your car at home with minimal water use. I. What is a Waterless Car Wash? A waterless car wash is an eco-friendly and efficient car wash that uses little or no water. Sometimes it is also known as a spray on car wash or no water car wash. Very often, a waterless car wash is much easier to use while producing similar or better results! It also allows the car detailer to service your car in narrow spaces (not too narrow) while saving surprising amounts of water. Waterless products are way more advanced than regular soap as they need to compensate for the lack of water. The efficiency of the waterless car wash is usually higher than that of using water-based methods. When processing a waterless car detailing, you might only need a bucket of water to rinse your towels instead of using between 50 to 100 gallons of clean water when using a pressure washer or a hose. II. How does a Waterless Car Wash work? A waterless car wash uses high lubricity sprays to polish and wash the vehicle’s bodywork. The spray’s high lubricity chemicals encapsulate dirt and dust particles. This process is similar to how water removes dirt, but the chemical combination of a waterless car wash product is more efficient due to the increased lubricity. You have to simply spray the surface of the car with the special formulae and subsequently wipe it off. This process removes any dirt or stains from the car’s surface. It works ideally for cars that don’t have thick dried mud to clean. A waterless car wash is only recommended for cars with light to medium dirt. Wiping down your car with a waterless car wash spray is advised by any auto detailer as water can sometimes hurt your bodywork and leave marks if you go about it the wrong way (think water jet spray). However, a high-quality microfiber is required when processing a waterless car wash.
A microfiber towel is used because of high absorbency and softness, which helps to scoop up these dirt particles. At Shiokr, we use only the highest quality microfiber (800 GSM) that no car wash uses at this price point. If the waterless car wash product is used correctly, it will not damage or scratch your car’s paint. Most corner car washes use vast quantities of water as they drown the bodywork in water and soap to remove as much dirt as possible (and as fast as possible!). Most commercial car washes use up to 170 liters – 450 liters of water per wash. An average bath takes around 40-80 liters of water, so you can imagine how much water is being used just to clean one car! A waterless car wash just requires 0.1 liter of waterless car wash formula used per car. In the cases where the car is caked in mud, you might require a full car wash for that. However, most vehicles in Singapore are not going to be caked in mud. Our city is way too advanced for mud to be on most of our vehicles. Most professional mobile detailers use homemade products by mixing different type of high lubricity sprays. We strongly advise you not to do so unless you are a car detailing expert. You are better off buying waterless car clean from the professionals. Our waterless car wash cleaner from one of the world’s top brand in Aero’s Cosmetic will set you back around S$99.90 and will allow you to wash your car up to 40 times. You can purchase the item over here. Firstly, you will need at least 3-4 clean microfiber towels and a ready to use waterless car wash product. We recommend using microfiber towels with a minimum weight of 300 GSM (grams per square meter). A low quality or dirty towel can damage your car. Imagine this, the microfiber cloths at Shiokr is 800 GSM in comparison! If your car has excessive mud, we recommend a rinse. A waterless car wash solution will not be effective against caked mud. Start by taking a microfiber towel and folding it twice in half to create eight usable sides. Remember that we use a microfiber towel because it offers high absorbency and softness, which helps to scoop up these dirt particles. Note: We highly recommend making sure the towels are clean before using them. Split up your car into different sections that you can work on at a time. You will want to use different microfiber clothes for different sections of the car. Stop using a cloth if it becomes too dirty or accumulates particles. Incorrectly using a microfiber towel can cause scratches on your vehicle. Never reuse a dirty microfiber without washing it first. Start from the top of the car so as to avoid spilling of products when you are in the midst of the process. Simply spray the waterless car wash product onto a panel of the vehicle, gently wipe with leading cloth in a S shape motion removing the dirt (do not reuse the same area if it is too dirty). Quickly buff using a second clean and dry microfiber cloth. When the towel gets too dirty, use one of the other clean sides. The idea of using a clean side every time is not to reintroduce the dirt on the car. Repeat this process as you clean the other parts of your vehicle. We recommend using a separate microfiber towel for the brakes since the brake pads may contain chemical fluids. There you go! You have a clean and shiny car which quality far surpasses your normal car wash stations. At Shiokr, we believe that waterless car washes are the future, especially for a country with no natural water resources. We also believe in hiring only locals for our car wash service to directly give back to our community. Download the Shiokr App now and allow professionals to clean your vehicle for you anytime, anywhere with just one tap of the phone. The app link is here. Join us in our journey to save millions of liters of water every year.